Fender Telecaster Bass Pink Paisley Model Solid Body Electric Bass Guitar (1968), made in Fullerton, California, pink paisley metallic paper with overcoat of clear acrylic finish, ash body, maple neck, original black tolex hard shell case. 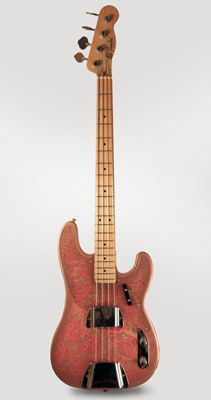 This fabulous bass is the result of one of CBS/Fender's most whimsical ideas in the summer of 1968-putting pink paisley or blue floral wallpaper on the tops and backs of Telecasters to catch the "Groovy" 1960's vibe at its late-decade high. The slab-bodied Tele shape worked well (the contoured Strat proved impractical!) and the instruments were released to. Unfortunately little acclaim! "Paisley Red pulsates with every beat and swirls in a blinding carousel of colors and forms" claimed Fender's promotion, and who are we to argue. The Telecaster Bass itself does not suffer any loss of function under this colorful livery-it remains a straightforward re-issue of the original 1952 Precision bass, with the same straight single-coil pickup and slab body. The maple neck on this bass is an early example of the just re-introduced original-style one-piece maple neck. Amazingly well preserved, this bass is one of the grooviest time capsules we have seen in a long time! Overall length is 46 in. (116.8 cm. ), 12 3/4 in. (32.4 cm.) wide at lower bout, and 1 5/8 in. (4.1 cm.) in depth, measured at side of rim. Scale length is 34 in. (864 mm.). Width of nut is 1 3/4 in. (44 mm.). This bass remains in spectacular, all original condition-down to the last screw! This is easily the cleanest and best preserved of this model we have ever seen. The usual heavy checking that often occurs on these paisley models when the finish shrinks over the wallpaper applique is mostly absent, only evident in a few small areas on the back. There is very little play wear to the neck-just some loss to the lacquer along the edge of the fingerboard on the treble side, at the body end of the board and a small spot under the low E at the 3rd fret. There is a small chip to the topcoat on the body on the treble side of the neck cavity, and some tiny edge dings. Other wear is negligible, just handling marks. We don't even want to take the neck off, the finish is so clean around the heel. The bass also plays and sounds fantastic. Super cool and an exceptionally rare find, complete with (of course) the classic original Fender HSC. Excellent + Condition.